The Contemporary Arts Museum Houston currently has two offerings in its galleries: It Is What It Is. Or Is It? (with some works discussed here by Virginia Billeaud Anderson) and Perspectives 178: CINEPLEX. There's an interesting contrast between the concepts of the two shows, which both involve the use of found materials. Upstairs (It Is What It Is) deals with the readymade, while downstairs (CINEPLEX) ventures strongly into manipulation. The latter is a captivating and sometimes challenging exhibition of video work, to be precise, and I have been thinking about it for a couple of weeks now. After I decided to write about it, I realized there are two aspects of the show I wanted to discuss: the work, and the overall presentation of the exhibition. So in true cinema fashion, this post will have a sequel. First up: the work. As you start down the stairway from the CAMH entrance, you begin seeing a flickering of light splashing across the downstairs space. It's an unexpected greeting to the exhibition, and I jokingly wondered if I was walking into a slasher flick. Indeed, cutting through the darkened gallery is a continuous and inescapable strobing light pattern, courtesy of Les LeVeque's white and fifteen movies starring Charlton Heston, which is projected floor-to-ceiling along the back wall. Still from white and fifteen movies starring Charlton Heston, Les LeVeque, USA, video. Image courtesy of the artist. The image above, however, hardly does the work any justice. (This is the case with most promotional stills form a video, of course, but it's even more applicable here.) The time you've spent glancing at that image as you jumped from the previous paragraph to this one is longer than the time you would have seen it in the actual video. You see, white and fifteen movies starring Charlton Heston is an experimental stroboscopic video work in which there are two frames of imagery followed by two frames of white. 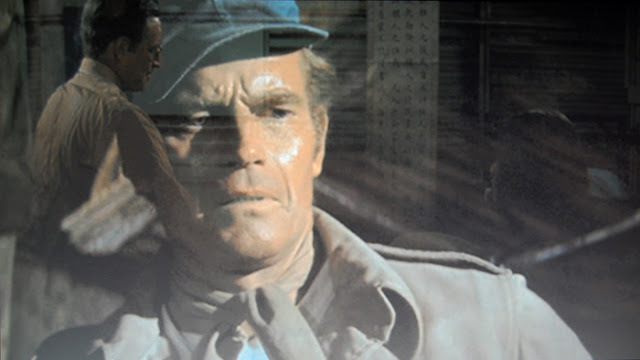 For this piece, LeVeque has reduced 15 different Charlton Heston movies down to thirty seconds each, and then spliced them together chronologically, adding the aforementioned white frames after every two frames of Heston film stills. To get a proper sense of the work, go here and watch a 30 second clip. I'll wait. Make it full screen. Now, imagine that continuously looping floor-to-ceiling on a wall in the gallery. I was a bit scared to even look at it at first. I asked a CAMH gallery attendant what he thought of the piece, and he replied that he "[doesn't] look at it." For those looking to avert their eyes away from LeVeque's work, there was Gustaf Mantel's IWDRM (If We Don't, Remember Me) projected on a wall near the stairwell. While I didn't recognize his name, I instantly recognized the series from the Internet, which made me feel hip. Mantel takes very short sequences from popular films and presents them as looping animated GIFs. “Because I want to fit in.”, from IWDRM (If We Don't, Remember Me), Gustaf Mantel, Germany, animated GIF. You can view all of his "living movie stills" on his Tumblr dedicated to the series. It was interesting seeing work inherently created for the Internet presented away from its natural environment. Then again, Mantel's GIFs come from video, so it's no surprise they function well as video once again. When I first saw Frederick Brodbeck's circular visualization of a movie (during my visits, it was of The Birds), I immediately thought of Jason Salavon's Emblem works from 2004. 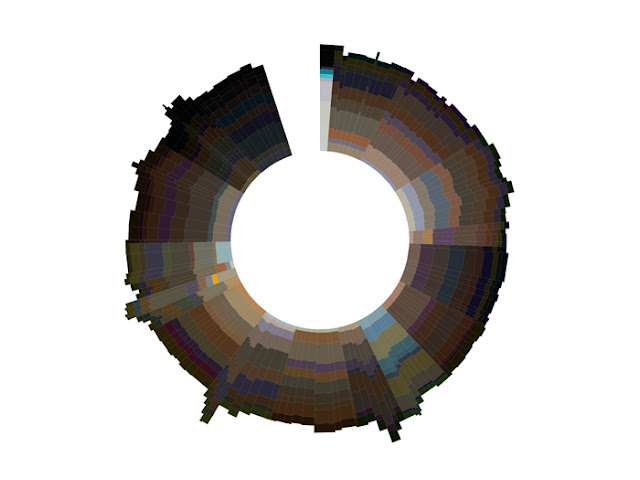 Both series present abstract representations of entire movies in a circular motif. Having bonded with Salavon's visualization work while in grad school, I wanted to dismiss this as a variation of Salavon's concept from 8 years prior. Additionally, I've seen a few other visual ideas passed around the Internet lately that Salavon himself worked through 5-10 years ago, so I'm a bit leery of seeing work that so immediately makes me think of his. That attitude is unjustified and unfair to Brodbeck of course, but that's the baggage I brought to the party. Still from Cinemetrics, Frederick Brodbeck, The Netherlands, 2012, video. Image courtesy of the artist. Working past the Salavon comparison, however, it's clear to see these visualizations are more complex. Most noticeably, Brodbeck's movie "fingerprint" (his term) is moving, unlike any of Salavon's static Emblem prints. I could make pretty solid guesses at to the purpose of the colors and segments resulting from the film's deconstruction, but the moving components were a new addition for me. What could have been left as a static image was now a pulsating mandala, (floating atop a white void, nonetheless, thanks to a soft drop shadow). The varying speeds at which some slices moved back and forth had me stumped. Enter Google. Turns out, Brodbeck has an amazing website dedicated to this project. There's an animated cinemetric at the top, which would give you a better sense of what's on display at the CMAH. The site is really worth a look, as are the two videos embedded there. He explains his objectives with the Cinemetrics series and all the variables through which he can filter a film's data. Having seen the website and explanatory videos, I wonder if the CMAH gave thought to presenting multiple cinemetrics simultaneously, as opposed to only one at a time. I find that seeing two or three side-by-side (as in the videos) really drives home what you're actually looking at. Against the other pieces in CINEPLEX – which are all narrative-based – I wonder how much of an audience the lone cinemetric can capture. I've embedded Telephones in its entirety below, but it's a nice experience – and nod to its own place in time – seeing it on the Sony Trinitron at the CAMH. Telephones, Christian Marclay, 1995, video. While these four works were on display in various regions of the common space, there was also an entirely separate theater constructed for CINEPLEX. It has the charms of a traditional movie theater: a dark space, larger screen, and elevated rows of cushioned chairs (46, to be exact). 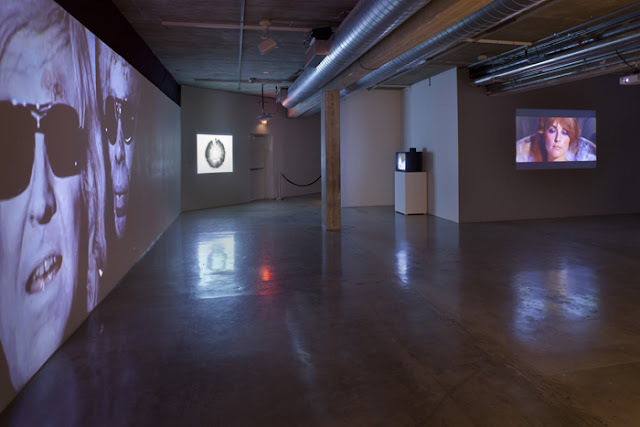 It was built to hold special Thursday night screenings of additional works, by filmmakers such as Thom Anderson, Sophie Fiennes, and Craig Baldwin. I enjoyed this space because, quite honestly, (1) I was able to sit down, and (2) my eyes could relax. That is, I could watch the work on display without the strobing light from white and fifteen movies starring Charlton Heston creeping into my field of vision as it does outside the theater. During my first two visits, the theater hosted the deconstructed animations of Austrian artist Martin Arnold, and these works became my favorite of the entire exhibition. Simply put, they were unlike anything I had ever seen. Still from Shadow Cuts, Martin Arnold, Austria, 2010, video. Image courtesy of Stadkino Filmverleih. Martin's three works – Soft Palate, Haunted House, and Shadow Cuts – featured clips from cartoons that had been deconstructed and spliced back together into new narratives. For instance, Haunted House features what I believe is a cat running out and screaming onto a porch. The original animated sequence is probably only a few seconds, but here Arnold has broken apart visual fragments from within those few seconds and stitched them back together into a four-minute sequence. When I say fragments, think of eyes, ears, tongue, skin, wood boards, window frames, etc. all appearing and disappearing independently atop a black background in a highly choreographed presentation. I was transfixed. It became a game of waiting to see how the image would reveal itself next. Moreover, it was interesting to see just how Arnold would use the various image fragments, and how the addition of new components would greatly affect the perceived narrative. Unlike the other two pieces, which presented mostly figurative elements, Haunted House used fragments from both the figure (the cat) as well as the background setting to great effect. The sad news is that Martin's works have now been rotated out of the exhibition. Moreover, they're not readily accessible on the Internet (as crazy as that is.) So it pains me to tell you about something I find incredibly awesome but you can't readily see, and for that I am sorry. But they are really awesome. I've been to see CINEPLEX three times already and am planning on returning at least once more before the show wraps up July 8th. I have found it to be a really engaging survey of recent and current approaches to video manipulation, and I fell it's worth your time to check out in person. It's also presented in a manner unlike any video exhibition I have ever seen, and I will dive into that in Part 2 next week.